Interested in having this shared as a presentation or workshop for your organization? This is available as a 3 hour workshop, 1 hour interactive videoconference, and downloadable podcast. Learn more, view upcoming schedules, and find download links on learn.playingwithmedia.com. Description: Learn to shoot, edit, and publish a video on an iPad in a fraction of the time this process takes with a laptop computer and “traditional” video gear! Flash-based video camcorders on mobile computing devices (like the iPad) can empower learners to create and publish “quick edit” videos. In this session we will view example iPad videos, discuss "menu thinking" for digital media in the classroom, explore different apps for quick-edit videography, and learn to to successfully facilitate student-created iPad videos. Prepare to have fun and unleash a wealth of creative ideas with your students during and following this workshop! Additional resources are available on the "Quick Edit Video" page of Mapping Media to the Common Core. 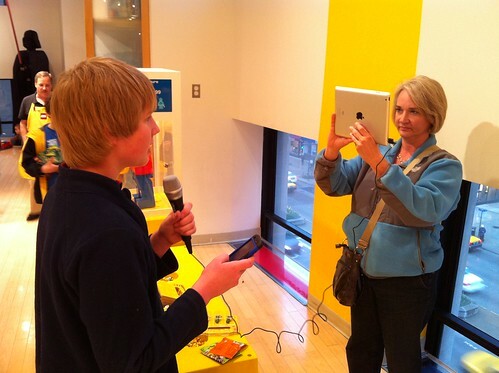 5 Teacher-created iPad Videos: "Favorite Videos from iPad Media Camp"
Other screencasting / narrated slideshow app options: SonicPics ($3) ScreenChomp (free), and Replaynote ($5). These materials by Wesley A. Fryer are licensed under a Creative Commons Attribution 3.0 Unported License. Contact details for Wesley are available.